The snapshot presents a concise overview of responsible investment (RI) practices in private equity globally, based on 486 signatory responses to the PRI Reporting Framework. It is intended to support PRI private equity signatories as they enter the new reporting cycle by allowing them to benchmark their responses against their peers. It also illustrates the extent of investor progress, by looking at comparable data points from 2015 and 2018. Search qualitative data by keyword to look for specific examples. See the methodology for the data collection process and limitations of results. What are GPs doing to implement the six Principles? What are LPs doing to implement the six Principles? US$1.05trn invested directly by 431 signatories in private equity assets: this accounts for approximately one third of global private equity assets under management (AUM), using an estimate from data provider Preqin of US$2.83trn as of June 2017. Private equity represents 2% of total reported PRI signatory assets under management (8% of indirectly managed assets and 1% of directly managed assets). Of the 1449 signatories who responded to the 2018 PRI Reporting Framework, 703 hold private equity assets. Although a significant majority of private equity signatories are headquartered in Europe, the AUM distribution chart below shows an almost equal split in signatory private equity assets between Europe and North America. This is because some of the largest LPs and GPs in private equity (headquartered in North America) are signed up to the PRI. 332 signatories reported on their directly managed private equity assets in 2018, compared with 209 in 2015. Respondents to these modules are listed on page 4 of the snapshot report, with a record of who also responded to the voluntary climate-related indicators which, were introduced to PRI reporting in 2018. Out of 1449 responses to the 2018 PRI Reporting Framework, 431 signatories reported that they invest in directly managed private equity assets – 94% of which apply RI considerations to these investments. Of these, 332, accounting for 80% of private equity AUM directly managed by PRI signatories, completed the Direct – Private Equity module. Their responses provide the basis for the GP data analysis in the snapshot report, summarised below. For signatories that reported in both 2015 and 2018, more than one third have processes in place to link RI objectives to the their portfolio managers’ and investment analysts’ key performance indicators. This implies an increasingly integrated approach to ESG throughout the firm and the investment process. Meanwhile, in terms of dedicated resourcing, the number of GP signatories that employ RI staff has risen from 89 in 2015 to 134 in 2018. 69% of signatories made formal commitments to RI in their latest fund terms, either using limited partnership agreements (LPAs) or side letters, or both. GPs can also refer to the PRI Limited partners’ responsible investment due diligence questionnaire to understand what information they might proactively disclose to prospective LPs through the PPM. In addition, PRI guidance on Incorporating responsible investment requirements into private equity fund terms is intended to help GPs understand how they might formalise their ESG-related commitments in the original draft of the LPA, or respond to LP requests to negotiate these into a side letter. However, on a regional basis, there has been notable progress in ESG disclosure among North American signatories who have reported in both years. In 2015, 29% did not disclose any ESG-related ESG information; by 2018, this figure had dropped to just 13%. 52% reported including ESG in the 100-day plan and 31% in the sale and purchase agreement. While most respondents use ESG factors to identify risks and opportunities in potential investments, far fewer report their impact on the price offered and/or paid; a more common approach is to incorporate ESG factors into the post-investment action plan. Publicly disclosed examples of ESG issues that were considered and managed across the investment process, from initial screening to exit, can be found on page 20 in the snapshot report. When it comes to exiting investments, 52% reported including ESG in the pre-exit information (this figure excludes those who did not have exits in the reporting year). Proving the value of ESG management at exit is the ultimate endorsement for an RI strategy for both the fund and its LPs. Publicly disclosed examples of how ESG was considered at exit can be found on page 19 in the snapshot report. For signatories that reported in both 2015 and 2018, the proportion who measure ESG performance and/or the impact of ESG on financial performance within the portfolio has risen from 25% to 47%. Publicly disclosed examples of how signatories are measuring this relationship can be found on page 22 in the snapshot report. It is worth noting that larger GP signatories are more active than their smaller peers across all of these areas of activity. It is part of the PRI’s role to support more resource-constrained GPs as they seek to improve their processes for integrating ESG into investments and to understand its impact. Similarly, LPs that represent larger organisations tend to be more active in integrating ESG across fund selection, commitment and monitoring. Publicly disclosed examples of how LPs addressed ESG factors in their manager selection, appointment and/or monitoring processes during the reporting year are set out on page 31 in the snapshot report. Of 1449 respondents to the 2018 PRI Reporting Framework, 349 signatories report that they invest indirectly in private equity – 89% of whom report that they integrate ESG in these investments to some extent. One hundred and eighty-nine signatories reported on their indirect private equity investments through the Indirect – Manager Selection Appointment and Monitoring module, accounting for 82% of private equity AUM indirectly managed by PRI signatories; their responses provide the basis for the LP data analysis in the snapshot report (including funds of funds and secondaries signatories). 30% review GPs’ PRI Assessment Reports. From this data, the PRI understands that more work needs to be done to encourage PRI LP signatories to leverage the tools that have been created to support ESG integration in the due diligence process. The PRI’s intent in developing these tools is to move LPs towards a consistent industry approach on ESG-related due diligence and monitoring, in response to significant demand from both LPs and GPs. There is evidently a need for PRI to build awareness around these resources and to promote more LP-to-LP dialogue and knowledge-sharing regarding best practice. This will be a core focus for the PRI private equity programme throughout 2019/20. 65% require ESG reporting from PE fund managers at least annually. It is worth noting that these numbers are significantly higher for European respondents compared with their North American peers. The PRI guidance on Incorporating responsible investment requirements into fund terms offers practical options to LPs that are considering how they might negotiate ESG terms into private equity fund contracts. 54% monitor the effect of ESG strategy on investment decisions and performance in the underlying portfolio. This indicates that reputational and risk management are the first priority for LP signatories when it comes to ESG objectives. 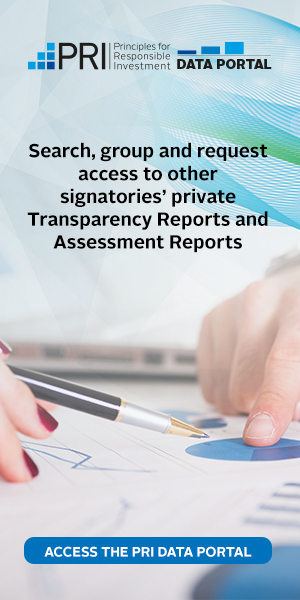 Only 37% of LPs use PRI Transparency Reports, and 24% Assessment Reports, to monitor GPs that are PRI signatories. The PRI encourages more LPs to use these reporting outputs and recognise their value as monitoring resources. The PRI Data Portal allows LP signatories to access and compare reported data for a desired group of GP signatories (although private responses can only be accessed with permission from the relevant GP). The PRI has created a tutorial on how to use the Data Portal for LPs that are interested in leveraging this resource. The PRI has also published guidance to support ESG monitoring, reporting and dialogue in private equity, which includes a section on current LP monitoring practices and a series of case studies to support LPs as they develop their approach to monitoring GPs on their responsible investment commitments. In the 2018 Reporting Framework, the PRI introduced voluntary climate reporting to support signatories in disclosing relevant activity in line with the recommendations of the Financial Stability Board’s Task Force on Climate-related Financial Disclosures (TCFD). Two hundred and forty-four signatories with private equity holdings (113 asset owners and 131 investment managers) opted into the voluntary climate reporting module in 2018 – including 167 who also reported on RI practices specific to their PE assets through the Selection, Appointment and Monitoring and/or Direct – Private Equity modules. Of these, 74 opted to make their responses publicly available. This is an important signal to the private equity industry of a move towards transparent and public disclosure on climate risk, and it should hopefully encourage other PRI private equity signatories to release such disclosures. 52% of respondents say they integrate climate issues into their overall risk management. 17% of respondents disclose on their observed emissions risks. This is up from 9% in 2016 (based on 686 respondents). For more results, please see the dedicated Climate snapshot report. Some analysis is based on additional filters which are not included in the public version of the snapshot report for data confidentiality reasons. Total reported PRI signatory AUM in 2018 is US$89.65trn. This figure falls to around US$81.7trn once the double-counting of assets that are directly managed by one signatory and indirectly managed by another is taken into account.